To help celebrate Take Your Dog to Work Week, Einstein Bros. Bagels is rolling out ‘Dogs Eat Free’, offering FREE doggie bagels from June 19-23 so pets can enjoy all aspects of office life, especially the treat of morning bagels! 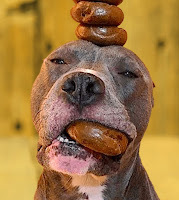 Following Take Your Pet to Work Week, dog parents will be able to continue to take advantage of the Dogs Eat Free offer and treat their companion to a FREE doggie bagel every Tuesday thereafter throughout the summer. Guests will need to visit www.EinsteinBros.com/DogsEatFree during Take Your Pet to Work Week to print a copy of the coupon, or simply show it on their mobile device at the register to qualify for the offer.